Built with six heatpipes in a top-flow configuration, the NH-C14 offers flexibility and excellent quiet cooling performance thanks to the two NF-P14 140mm fans. The NH-C14s six heatpipe c-type design allows for superb quiet cooling performance while maintaining a much lower profile than today's tower-style coolers and providing excellent airflow over RAM modules and near-socket mainboard components. 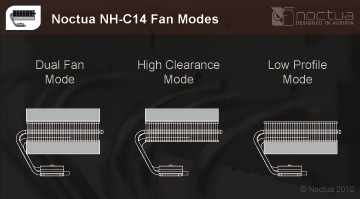 The NH-C14 comes with two of Noctua's award-winning, premium quality NF-P14 140mm fans that can be fine-tuned according to the users needs via the supplied Low-Noise (L.N.A.) and Ultra-Low-Noise Adaptors (U.L.N.A.). 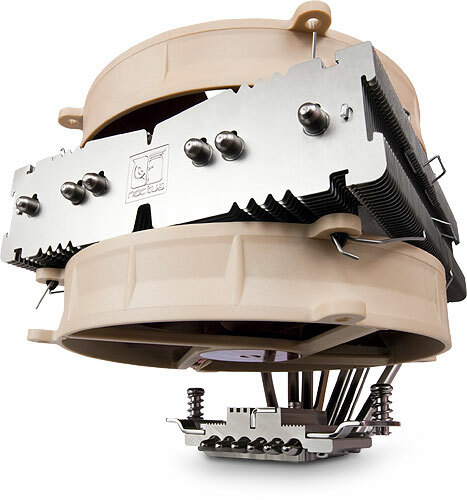 The lower NF-P14 fan can be removed in order to provide additional clearance for chip-set coolers or RAM modules with tall heat-spreaders. Run with a single fan on top, the NH-C14 provides a full 65mm of clearance. Noctua's enthusiast grade SecuFirm2 multi-socket mounting provides broad socket compatibility (LGA1366, LGA1155/6, LGA1155, LGA775, AM2, AM2+ and AM3) and meets the highest demands in safety, performance and ease-of-use. This is clearly an extremely well made product; and Noctua was great in terms of support on a couple of enquiries. It is pretty quiet. I would have given it 5* (and may in due course upgrade) if the fans were more controllable. I don't understand - given that Noctua know motherboard designers have a variable approach to fan speed control - why they don't equip this cooler with PWM fans. Noctua has recommended a work-around (using a "Nanoxia PWMX" PWM => voltage adapter), but wouldn't it have been a whole lot easier just to use PWM fans to start with? As it stands, the noise level is quite low, and not unpleasant, but running at 1300RPM the cooler is definitely not silent. I could use the supplied LNA or ULNA resistors, but that would limit the fan potential if they ever need to ramp up high. But, as I say, a very good product nevertheless.